Day 5 – Is Conservation Agriculture Better for Women? Does conservation agriculture increase or reduce labour for women? After waking up on Day 5 in Santa Helena, we started with a very enlightening visit to a research centre CAP (Centro Avancada de Pesquisa) in Missal, which aims at searching for solutions for family farmers of the south-western Paraná region. Traditionally, smallholder farmers have used high levels of pesticides in maize, bean and soy production, and in 2003 the CAP was formed to search for ways to diversify production and make it environmentally sustainable as well as economically profitable for farmers. The CAP concentrates on capacity building of farmers, and on validating results through demonstration of innovative cropping systems, including mixed crop-livestock systems, and agro-processing. This local adaptive research is especially relevant for the area such as south-west Paraná, where temperatures vary between 0 and 45 degrees Celsius. The CAP research centre includes a 7-hectare area for demonstrations of sustainable and diversified farming, including intercropping, use of cover crops, production of seeds and seedlings, and processing of for example various fruits. Another interesting aspect of the CAP is the way it works with public and private entities, including the second largest dam in the world, the Itaipú Dam. The electricity company provides financial assistance to the CAP as a form of payment for environmental services, because keeping erosion under control reduces operating costs of the dam. The smallholders farmers, the municipality of Missal, and the wider environment all benefit. As examples of diversified production systems that CAP promotes, we also visited two family farms in the Missal area. The first farm, managed by Luis and Terezinha Trevisan, is dedicated to dairy production. With the help of the PRONAF loans that we also mentioned in Day 4's entry (2% interest per year over 8 years with 2-year grace period) and EMATER technical assistance they have been able to diversify their production to pasteurized milk and cheese on their farm. Daily they produce and process about 200 litres of milk from their 20 heads of cattle. Finally we had an opportunity to visit a smallholder association market. The Bauernhouse market, located in town, sells the products of over 80 family farmers from the municipality of Missal, and also sells to governmental programmes such as school feeding. 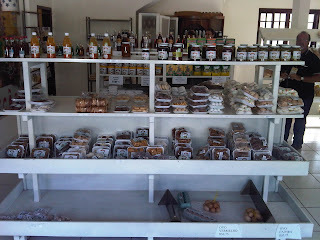 This market is a great example on how organized smallholders can sell their outputs effectively in the local market. Farmers receive 79% of sales with 21% going to the association. They hope to upgrade to cooperative status so they can issue forward contracts and other services. Does CA increase women’s workload – for example by shifting labor from planting to weeding? And what about that troublesome transition period of 1 - 15 years? Today a group of participants discussed the issue. Marietha Owenya of SARI (Tanzania), Rebbie Harawa of AGRA (Kenya) and Phillis Mwansa, Ministry of Agriculture, (Zambia) share their insights and experiences here. Not surprisingly it is difficult to make a blanket assessment, because agro-ecological, social, cultural and cropping systems (and enabling environments) vary so markedly from zone to zone, including within countries. Success depends largely on the ability to accumulate enough biomass for groundcover. Research indicates that weed control is a major labour constraint without the use of herbicides under most conditions (see slide 4 of Marc Corbeels’ ppt from Day 1 – and the paper referenced below). That said, participants feel that CA is a winner for women – including women headed households: here’s why. 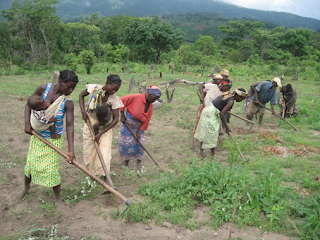 Field preparation – less labour for both women and men with CA: In conventional systems with no machinery or animal traction available, women prepare fields/their farms using hand hoes. Men will prepare the land if machinery or animal traction is available regardless of the crop. CA reduces the time necessary to perform this task in either case because ploughing is discarded in favour of: 1) digging basins (this is labour intensive initially but the labour can be spread over months, and give women more flexibility in time use, and lessens over the years). Men also may participate in digging basins, 2) ripping into the ground cover, which is quicker than ploughing a whole plot/field and requires less energy from animals. Also, the conservation agriculture tools are lighter and more easy to use. Planting/Seeding/Sowing – less labour for women with CA: In conventional systems both women and men are involved, with women planting beans and other crops by themselves and women and men planting maize and cash crops together. The man will plant generally when animal traction or machinery is available, opening the furrow, with the woman following immediately behind (often with a baby on her back) to plant the seed. Women plant legumes, including beans, by themselves. If a “planting stick” / “dibbler” is in use, the man will make the holes and the woman, again, will follow behind to seed. In any case, the woman is always involved and almost always linked directly to the man. With conservation agriculture, women will use the jab planter or hand/hoe seed by themselves – and the jab planter does 4 things at once: opens the hole, plants the seed, fertilizes, covers the seed. The jab planter saves women time and renders them more autonomous in managing their time. Where animal traction (or machinery) is available their labour is freed as men use the CA seed planters, which both seed and fertilizer. Weeding – less labour for women with CA with caveats: Weeding will tend to fall to women in either conventional or conservation agriculture systems, except, at times, in the case of crops that men consider particularly important such as maize or cash crops. Ploughing has the advantage of clearing the field of weeds for up to a few weeks while the newly planted crop grows, with weeding coming later to differing degrees depending on crop type and climatic conditions. Under conservation agriculture if herbicide is used (glyphosate has been promoted as part and parcel of transitioning to CA systems in Africa) labour is greatly reduced for women initially. As the main crop grows, weeding can become more complex depending on the cover crop in use and the herbicide and tools/instruments available, and can be very time consuming, substantially increasing labour for women. If the household owns a backpack herbicide sprayer or a sprayer implement (see demonstration video Day 2) then the man will tend to do the pre-emergence “weeding,” significantly reducing labour for the woman. Post-emergence weeding is more expensive (additional herbicide, implements and necessary know-how costs) and tends to fall to women in the absence of extra herbicide or tools. Women will either hoe-scratch the weeds for minimal soil disturbance or manually uproot. The better the soil cover the shorter the transition period to significantly reduced weeding. Harvesting – no difference in labour for women: In systems where the family harvests its own outputs, there is no difference in division of labour. Certain changes will, however occur under CA, including increased yields which increase labour / time spent on harvesting, However it is more efficient harvesting because the same field is producing more. The participants have observed that families tend to plant the same crops under CA, although proportions of crops may change due to the crop rotation requirement. Increased Productivity - benefits to women: Marietha (participant from SARI, Tanzania) tells the story of Maria Erro, a widow with six children in Karatu, Arusha, Tanzania who, four years after adopting conservation agriculture on her 1.5 hectares of land was able to upgrade her home from thatched to corrugated iron. In general: Increased productivity of main crop and introduction of legume cover crop (lablab, pigeon peas) outputs bring food security and extra protein for the family. The woman can invest her time saved in her children and preparing better meals – “food brings harmony to the couple / household.” Diversified production on the field spreads risk of the family and may result in extra outputs or cash with which the woman can procure food to improve the nutrition of the children. Extra income that comes from surplus can be invested (usually by the man) in inputs for the farm, health care and/or education of children, and improvement of the family dwelling. during transition periods of up to 10 - 15 years are observed (refer paper by Rusinamhodzi, Corbeels, van Wijk, Rufino, Nyamangara & Giller: A meta-analysis of long-term effects of conservation agriculture on maize grain yield under rain-fed conditions). Households need support from extension services if they experience reduced productivity during the transition periods. Thanks also to Waltteri Katajamaki for his contribution to this blog post.